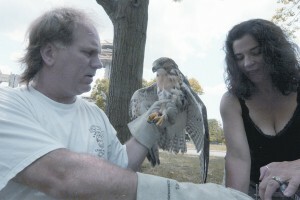 Bobby and Cathy Horvath, wildlife rescuers from North Massapequa, tending to a hawk. Oyster Bay town officials have reached an agreement with a North Massapequa nonprofit wildlife rescue group that had been summonsed for housing dangerous animals in a residential house two weeks ago. Bobby and Cathy Horvath have agreed to give their bobcat to the Brookhaven town’s wildlife center in Holtsville and start rehabilitating animals at Nassau County’s Seaford-based Tackapausha Museum and Preserve, which the couple is already affiliated with. Wildlife In Need Of Rescue & Rehabilitation, which has rescued about 500 animals annually since 2002, has New York State and federal permits for their wildlife rehabilitation operation. But, Oyster Bay Supervisor John Venditto said the permits don’t override town code forbidding dangerous animals in residential neighborhoods. Venditto said the summons will be dropped and the couple will not be fined as a result. A code enforcement officer had originally responded to the home after an anonymous complaint from a neighbor about the smell. Det. Bob Sowers, the lead investigator for the Nassau County SPCA—the nonprofit group that enforces animal cruelty laws—said the service the Horvaths provide is invaluable.